Who knew? Green Day's frontman, Billie Joe Armstrong loves musicals. He even has a tattoo of Jesus Christ Superstars' logo on his right arm. 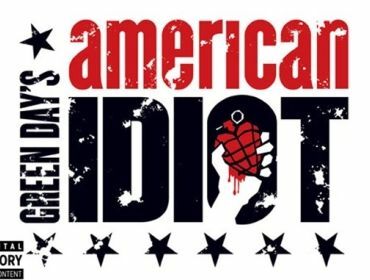 As you may have guessed, yes, this is a musical based on Green Day's seminal American Idiot album, which was released in 2004 with hits like Wake Me Up When September Ends, Holiday, and modern rock sing-along (or sing-alone) anthem Boulevard of Broken Dreams. But, no, this show is not about Green Day. It is not, as some might assume, a story about their elevation to rock fame, or anything like that. It is about three young men's despair and journey for meaning in a post-9/11 America. It is deep and meaningful. I wandered into the New Theatre on Tuesday night wondering who on Earth would be in this audience. How many young people go to musicals? How many older people like Green Day? I could see many enviable people with Green Day live tour t-shirts on their backs. With what sort of show would we be greeted? The set, on finding our seats, was gloomy, grey and graffiti-garnished, and there was a lone TV playing in the centre. It was spewing out repeat after repeat of 9/11 clips, President George W Bush addresses and scared and, in some cases, scaremongering Americans' interviews. The show was more about a theme than a story: disillusionment. The whole show was about different young men's reactions to 9/11. It started on September 12th, with the lead character, Johnny saying he'd spent the whole day alone in his room doing adult activities you'd rather not imagine. [A quick warning -- there is swearing every other word at the start of the show and lots throughout.] The invincible can-do bubble of the American Dream had burst. American Idiot is a state-of-the-nation snapshot, penned whilst war raged in Iraq. Its aim: to bring a voice to a young generation "born and raised by hypocrites" (quote from Jesus of Suburbia) in a system, as the show programme puts it, that 'denied control to individual citizens even as it threw them into yet another military conflict. The graffiti fantastically depicted people with televisions for heads and limp bodies, to show a brainwashed population that drags it heels along like zombies without thinking for themselves. As American Idiot the song says: "one nation controlled by the media". It was a perfect depiction -- something that would have been at home in Cardiff's beloved Abacus - since we had been subjected to messages through the lone TV onstage at the start. Had we thought for ourselves or had we let the fear and the state do the talking? Nobody really knew what to expect when punk rock meets musical, or, as the show programme puts it, "Snotcore meets Broadway". Admittedly, my +1 and I wondered what on Earth we'd gotten ourselves into when the lone TV's repeats suddenly stopped and the cast came bursting out singing and flailing around in some weird, drugged-up, musical-punk mash-up of the album's title track, American Idiot. It was a shock to the system. Truthfully, it took us 2-3 songs to settle and get into the show's style, but, when we did, it was really something to behold and savour, and there were another 20 or so songs to enjoy! Strangely, American Idiot the song has always been my least favourite song on American Idiot the album, and it was no gentle handshake of an introduction to a punk-musical genre that has to be seen and heard to be believed. This probably explains a lot of our initial unease. But, there was no other way to start this show than with the title and lead song of the album, especially as every single album song was subsequently played in order (yes, only a major fanboy, or avid Google-er, would know that). "The choreography wasn't limited to just air guitar playing... and was a true highlight"
After American Idiot the song, I wondered (dreaded) if they'd just continue strumming the air for the next 2 hours. I thought, "That wouldn't be a stage adaptation, that's what I do in my bedroom every evening". Fortunately, the choreography wasn't limited to just air guitar playing and was a true highlight during all songs - creative and powerful throughout. Perhaps the cleverest and most powerful scene of all was when two of the young men's futures were played out at the same time to explosions in the music: one (Tunny) fighting alongside several soldiers who invaded the stage, the other (Johnny) with his passion in a solitary bed in the middle of the enveloping warzone. 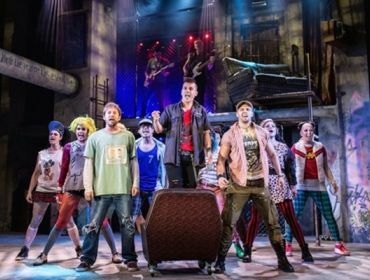 "More like a gig than a musical"
American Idiot faithfuls like myself (are we just called American Idiots?!) would know that there are only 13 songs on the album (and I may or may not know all the words #justsaying), yet they filled about two hours with music. In fact, it was more like a gig than a musical, as there was particularly little dialogue. 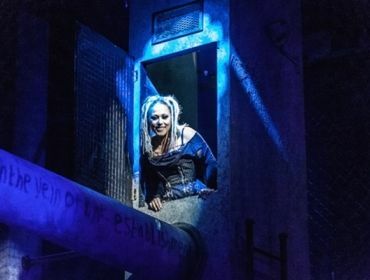 This production cleverly also included much-loved and well-placed Green Day songs from other albums, such as 21 Guns, Do You Know Your Enemy and Good Riddance (the perfect song on which to end, of course!). It was to good effect. Shout out to the musicians and New Theatre - the music sounded superb. Whilst the New Theatre is obviously used to staging shows and has the acoustics for it, this was more of a rock gig and it really held up strongly. Not to sound too sadistic, but one of the best scenes for me was when, Tunny, hospitalised after having his leg blown off at war, sings writhing in agony - it was an amazing, explosive encapsulation of pain. He screams rather than sings (lots of) the lyrics of Before The Lobotomy, from Green Day's 2009 album, 21st Century Breakdown. The lyric "scattered dreams" sums up where the character is at here. Furthermore, they brilliantly mash-up this song with the slower, intoxicated love rock song, Extraordinary Girl. Here, his mind moves onto dreams of a woman (who's also called Extraordinary Girl). It's a sweet release from his broken life and body. Powerful. All the voices were generally praiseworthy, particularly Whatsername's (that's the character's name, honestly! ), played by 2011 X Factor finalist, Amelia Lily. She had stage presence and sang often aggressive and variously-pitched pieces with ease. In the short periods when there was acting with dialogue in between songs, it was good across the board -- and perhaps even slightly better than the singing. "Beautiful rendition of Boulevard of Broken Dreams"
Matt Thorpe* was a natural at playing the lead character, Johnny; absolutely looked the part, with everything from his walk and mannerisms to his hair; and he was an accomplished singer with a sometimes soft and sweet but sometimes gruff and biting voice. His beautiful rendition of Boulevard of Broken Dreams alone on the stage with just an acoustic guitar and a bright white spotlight on him was a show highlight. The strong, gruff voice of Alexis Gerred, who played Tunny, was a pleasure throughout, and Lucas Rush, who played the shadowy joker-like figure of St Jimmy, was centre of attention most times he was onstage, due to his cheeky, fun and mysterious persona, mile-high blond Mohican and strong singing voice. Recommended for music-lovers or anyone simply interested in the last 15 years. Suitable for Green Day fans or non-Green Day fans, regular musical-goers or new ones. Electric, thought-provoking and rebellious. In the famous words of George W Bush (just used with more accuracy here), "Mission accomplished". *A special note to say that Johnny will be played by Newton Faulkner -- who graced Cardiff SU earlier this month -- from 7th May 2016.